For the first time this evening, I came across a dhow-making yard (above) in Bahrain, complete with slipways and other infrastructure one would normally see at a large shipyard. 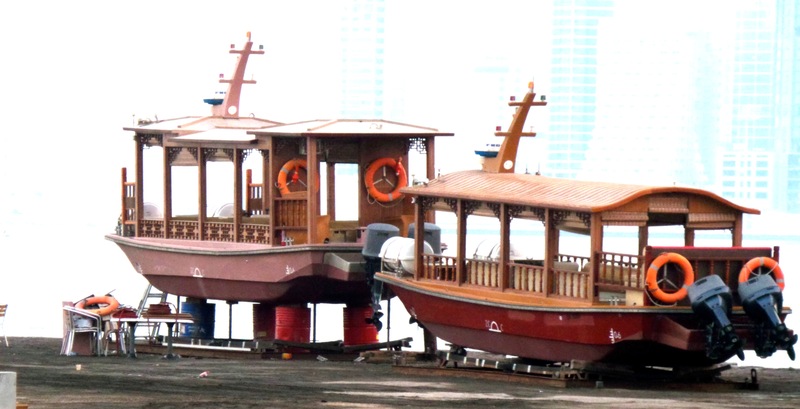 While it wasn’t surprising to see the dhows (traditional fishing vessels) being manufactured were primarily of steel with a smattering of wood, what caught my eye were two “dhows” that were being readied as speedboats (top), complete with two outboard motors each, and outfitted with cushioned seats to take tourists around Bahrain waters. Whoever is behind such an initiative is possibly a genius because he is doing what everyone in Bahrain has wanted should happen. Even though the island nation is rich is marine wealth, there are no properly organized tours that take around those attractions. This is, perhaps, the beginning that everyone wanted.